oogle took an initiative to make their applications and systems more secure by awarding prizes to anyone who found a legitimate bug which could be exploited. 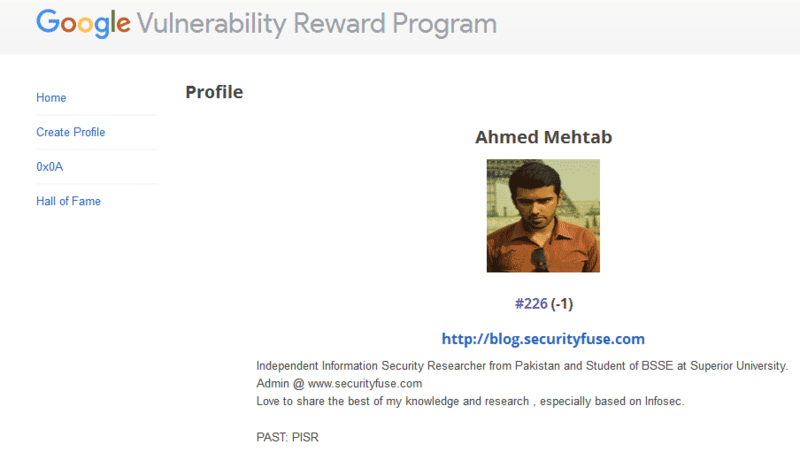 Recently Ahmed Mehtab, a Pakistani student and CEO at Security Fuss, was listed in Google’s Hall of Fame for his contribution in Google’s Vulnerability Reward Program. If recipients smtp is offline. If recipient have deactivated his email. If recipient does not exist. If recipient exists but have blocked us. Attacker try’s to confirm ownership of xyz@gmail.com. Google sends email to xyz@gmail.com for confirmation. Attacker takes that verification code and confirms his ownership to xyz@gmail.com. Google started this program to highlight bugs and other hacking vulnerabilities faced by Google-owned web service. The scope also included Google-developed apps and extensions published in Google Play, iTunes or Chrome Web Store. Whoever highlights the vulnerabilities and creates a guide on how it can be exploited can earn up to $20,000 from Google as a reward.